Indigenous peoples have long made their home in the Northwest Coast ecoregion. The Makah, Quileute, Quinault, Queets, Humptulips, Satsop, Wynoochee, Copalis, Chinook, and Lower Chehalis are among those whose ancestors lived on the rainy coast. Dwelling in longhouses along the waterways, these peoples thrived on the region’s natural bounty. They ate well: on salmon and shellfish, on game, on whales and seals, and on berries and other plant foods. Many were exceptionally skilled at making canoes from western red cedar. They traveled in canoes on the rivers, estuaries, and the open ocean. Today, the ecoregion counts half a dozen Indian reservations, the largest being the Quinault and the Makah. Captain James Cook, exploring the region in 1778, was likely the first European to see the coast. Many other Europeans, primarily British and Spanish, soon followed. The diseases they brought devastated the populations of the indigenous peoples. The fur-trade period (1790s–1850s) was followed by Euro-American settlers in the mid-nineteenth century. Settlement gained momentum following the treaties of 1854-5. The rich timber resource of Douglas-fir, western red cedar, western hemlock, and Sitka spruce provided livelihoods for generations of Euro-Americans in the Northwest Coast ecoregion. While timber remains an economic powerhouse, the harvest of non-timber forest products is increasingly important. Mushrooms, ferns, mosses, and salal all find their way to market. The marine environment sustains commercial and sport fishing, crabbing, clamming, and oyster growing. On land, agriculture includes cranberry bogs and dairy farms. Tourism and recreation activities increase yearly. Today the ecoregion is dotted with small communities and one growing metropolitan area, Aberdeen-Hoquiam in Grays Harbor County. Within the ecoregion, more than 50% of the land is privately held—much of it by timber companies. Another 30% is federally owned. The remainder is held by the state, local, and tribal governments. The U.S. Forest Service, through the Olympic National Forest, controls about 15% of the region. Much of its lands have seen considerable impacts from logging activities. 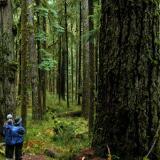 The ecoregion’s largest wildland area is Olympic National Park. It has been recognized as a World Heritage Site by the United Nations Educational, Scientific and Cultural Organization (UNESCO).